Pack your lunch, skip a meal or donate what you might spend on a meal for a friend. 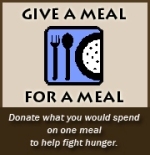 Join our "Give a Meal for a Meal" campaign in conjunction with Twitter for Food, a montly program to help fight hunger by donating what you spend on one meal to a hunger relief organization. The power of your donation goes far at the Food Bank: for every dollar donated, we can provide $10 worth of food or 5 meals! Just think: a $5 donation will provide lunch to 25 struggling seniors... $10 will bring breakfast to 10 school children for one week... $15 will provide dinner to a family of four for nearly 3 weeks! By skipping just one meal, you can furnish many meals to those suffering from hunger in our communities. who are struggling throughout the year. See "Sustaining Gift" options below. 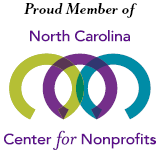 the Food Bank of Central & Eastern North Carolina! Total Gift: Use the Calculate button to view the total amount of all gift payments for your donation. Use the Calculate button to view the total amount of all gift payments for your donation.